“When the sky was young and the world just a dream, when the stars were still learning their names, a spider named Nobb came floating through the air, at the end of a long soft thread. On her back was a white, white egg. ‘I need someplace to set my egg,’ said Nobb. ‘The time is near for it to hatch. 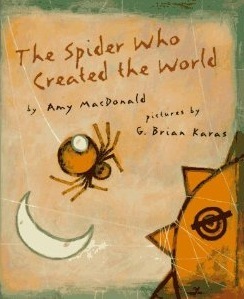 '” In this original creation myth Nobb finds that no one likes spiders – not the Sun, not the Moon, not even the Cloud. But that doesn’t stop a wise and determined spider like Nobb from finding a home for her egg. I have always had a soft spot for critters that no one else liked. As a child I was always rescuing frogs (about to be swallowed by snakes) and baby mice (discovered in my sleeping bag!) and even spiders (about to be washed down the drain). Perhaps it was the spirit of those unloved creatures that inspired this myth about how the world was formed. What have the reviewers said? Enter your email to follow this blog and be notified of new posts and news from Amy.